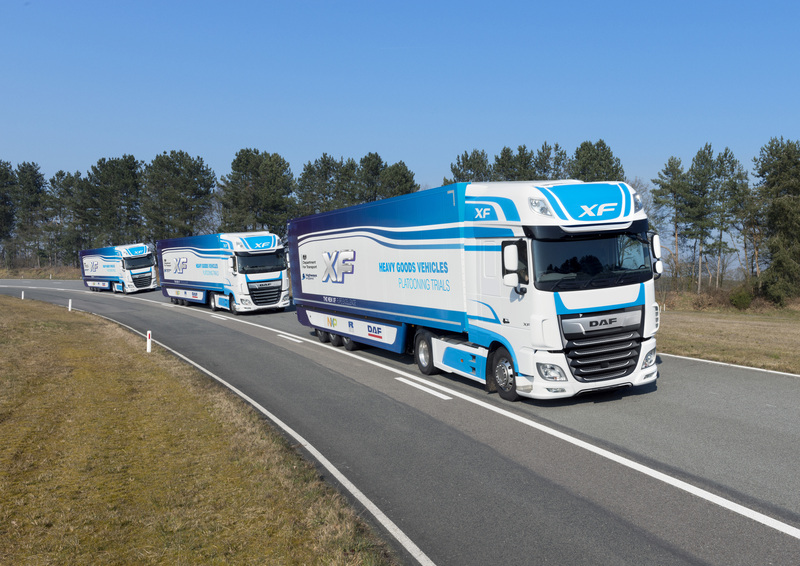 DAF Trucks participates in UK truck platooning trial - DAF Trucks N.V.
DAF Trucks will participate in a two year truck platooning trial in the UK, led by TRL, the UK’s Transport Research Laboratory. Together with its partners, TNO, Ricardo and logistics company DHL, DAF Trucks has been selected by the UK government’s Department for Transport, in conjunction with Highways England to gain experience with truck platooning on selected routes on England’s strategic road network. The first platooning DAF test trucks are scheduled for trials in the UK in the coming months. With the truck platooning trial, the UK government looks forward to gaining experience with this new innovation that can bring greater efficiency to road transport. Platooning enables trucks to drive in close formation, leading to lower fuel consumption, reduced CO2 emissions and improved traffic flow, by using advanced driver assistance systems that contribute to increased road safety. In truck platooning highly advanced Wifi-P, radar and cameras allow two wirelessly connected trucks to drive at a short distance apart. Using the driving information from the first truck in the platoon, the following vehicles can automatically accelerate, brake and steer. While platooning, when the lead vehicle brakes the following vehicles automatically brake with no noticeable reaction time significantly increasing road safety. This enables the gap between truck combinations to be reduced as much as possible, which due to slipstreaming can save 10% in fuel and an equivalent reduction in CO2 emissions. Another benefit of truck platooning is the improvement to the flow of traffic for other road users because platooning trucks do not overtake each other. Furthermore, truck platooning technologies can allow passenger vehicles to join the traffic or leave the motorway safely and responsibly, even when crossing a truck platoon. The advanced driver assistance systems that enable platooning will also contribute to road safety. Unlike human beings, the systems are always alert and respond 25 times quicker than a top sports player. "DAF is honoured to participate in the TRL-led field test involving a three truck platoon for the UK Government, ", says Ron Borsboom, member of DAF Trucks' Board of Management and responsible for product development. “The trials will enrich our understanding and knowledge of the benefits that platooning can deliver, whilst at the same time we can support the Department for Transport by building evidence of how platooning can improve transport efficiency. But let me be clear: It goes without saying that there is still a lot of technical development ahead of us before we might be able to introduce platooning to the market. This trial, however, is an important and necessary step we need to take,” he said. DAF Trucks has been at the forefront of Truck Platooning technology since early 2015, when the company launched the truck platooning EcoTwin project together with NXP Semiconductors, TNO (the Netherlands Organisation for Applied Scientific Research) and safety institute, Ricardo. Since then, DAF test drivers have driven tens of thousands of miles on both public roads on the European mainland, and on the DAF’s state-of-the-art test track, to continuously improve its truck platooning technologies. In 2016, DAF participated successfully in the European Truck Platooning Challenge, initiated by the Dutch Ministry for Infrastructure and the Environment.